At the beginning of this year, Chinese upstart LeEco (then called LeTV) announced the first ever smartphone powered by Qualcomm's Snapdragon 820 chipset - the Le Max Pro. The SD820 then went on to feature in most flagships launched in 2016, but now it's almost time for a refresh. And it looks like once again LeEco will be the first company to have a phone sporting Qualcomm's latest silicon inside. It's holding an event on June 29, during which it's expected to unveil the first handset powered by the upcoming Snapdragon 823 (also known as Snapdragon 821 sometimes), which is basically just an improved version of the 820. Now it seems that LeEco's SD823 device has been put through the paces of the AnTuTu benchmark, something which has helpfully revealed many of its specs. 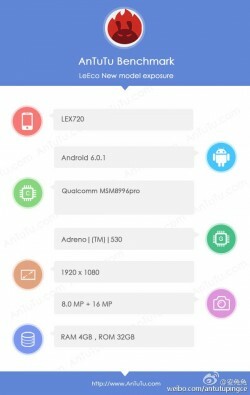 As you can see from the image to the left, this is a LeEco phone with the Qualcomm MSM8996pro SoC - that's been rumored to be the model name of the SD823, by the way. The device has a 1080p touchscreen, a 16 MP main camera, and an 8 MP selfie shooter. RAM is 4GB (but since the Le Max 2 has 6GB we assume there will be multiple hardware versions here, one with 6GB), and built-in storage sits at 32GB. The new LeEco smartphone runs Android 6.0.1 Marshmallow as you'd expect. It managed to score a very impressive 154,272 in AnTuTu, which means it will (obviously) be more powerful than the SD820-powered Le Max 2. Thanks for the tips, Aman and Danny! When its going to lounge?? You're not the only one, I too can't LeStandIt! This phone is good though, all that's left to be revealed is the battery and price.